You all remember the scenes of devastated forests after recent storms like Hurricane Michael, which caused billions of dollars of damage to forests in the Southeast this fall. Other big hurricanes in past years have also caused significant damage to forests. But how do the forests repair themselves after a big storm? 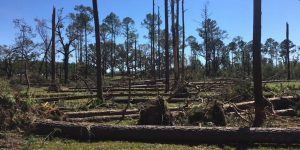 The Scientist has an interesting long article on the opportunities recent large hurricanes have made for scientists who study forest resiliency and what they have learned from watching the forests recover. You can read it at https://www.the-scientist.com/features/how-trees-fare-in-big-hurricanes-65335.